These pages are intended to serve as a short practical introduction to the fascinating heritage of Manitoba’s church architecture. It is neither comprehensive in scope nor scholarly in approach. In the following pages we shall examine four different Manitoba churches, belonging to four different Christian denominations, and located in four different parts of the province. Each of them is in a rural setting and three of them are situated several kilometers off the main highway. In an age when parents often buried their children, and when smallpox, typhoid, and tuberculosis remained potent killers, these churches were a source of consolation and hope. In an age when one’s nearest neighbors might live several miles away, these churches served as the social and cultural centres of the community. In an age when depression, drought and catastrophic war endangered the very lifeblood of the towns and villages, these churches ensured the preservation of all that which was most precious and most vulnerable to destruction. When a town, village, or hamlet disappeared-as has so often been the case in Manitoba-it was generally the church, which was last to go, as if it were the one remaining link with the pioneering spirit, which had triumphed-albeit temporarily-against overwhelming adversity. In their own unpretentious way, these churches are as essential to the Canadian landscape as the thirteenth century Gothic cathedrals are to Europe. 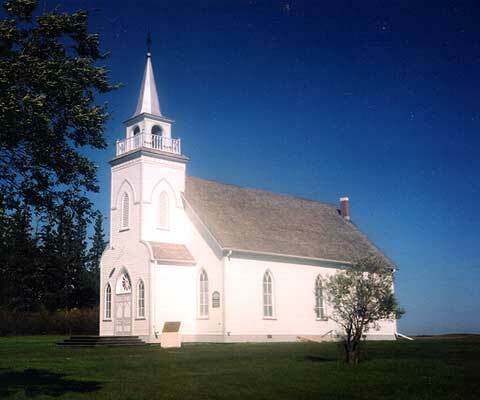 From the middle of the 1840s until the end of the 1870s a series of Anglican churches was built in an arc extending from the northeast near Lake Winnipeg to the southwest near Poplar Point. The surviving structures are among the most historic in Manitoba. St. Peter Dynevor located a few kilometers north of East Selkirk off Provincial Road 508. St. Clement’s Mapleton, located off Highway 9 just south of Selkirk. St. Andrews-on-the-Red located on River Road north of Winnipeg. 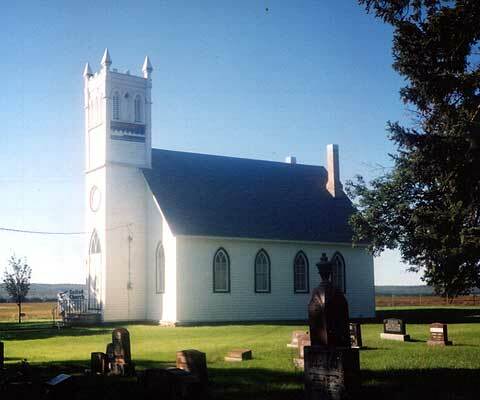 St. Paul’s, known as Middlechurch and located off Highway 9 just north of the Perimeter Highway. St. James located along the Assiniboine River in the cemetery across from Polo Park. St. Anne’s, the farthest west, located off Highway 26 near the village of Poplar Point. Besides these buildings there is one more historic Anglican church which does not receive as much attention as the others, but which does have an interesting history in its own right. Erected in 1877, All Saint’s Victoria is located a few kilometers northeast of the town of Stonewall in an area originally settled by immigrants from Ontario and by retired soldiers of the Wolseley expedition of 1870. The guiding light in its construction was the Reverend Samuel P. Matheson, later Anglican Primate of All Canada and Chancellor of the University of Manitoba, but in 1876 a young visitor to England where he secured funding with which to finance the project. All Saints is named after a parish church in the English city of Shrewsbury. It is primarily of log and wood construction, was designed by committee, and was built by predominantly volunteer labour under the supervision of carpenter Alexander Dahl. Apparently the church was dedicated on 23 December 1877 in the midst of a torrential three-day rainfall! The arched windows and high-pitched roof of the structure are typical of the Neo-Gothic style, which was frequently employed in the church architecture of the time. Mounted atop the façade of the building is an unassuming little belfry above which stands a cross silhouetted against the sky. Curiously enough the bell was lent to the congregation by the warden of Manitoba Penitentiary (now Stoney Mountain) for a period of ninety-nine years. Land for the church and cemetery was donated to the parish by Reverend Matheson. He also delivered the sermon at services marking the fiftieth anniversary of the church in 1927. The building has been closed since 1954, but a small endowment fund has ensured that it remains in good shape. Unfortunately its isolated location has made All Saints Victoria subject to occasional vandalism and the church is generally locked. However, much of the interior can be seen by looking through the arched windows along the sides of the building. A central aisle, flanked by two rows of rather Spartan benches leads to a lovely openwork partition, which separates the short nave from the chancel. The most interesting feature of the church is a stained glass window at the rear of the building. From a disembodied hand a series of alternating vertical yellow and blue bands descends to the base of the window. A sheaf of grain and a bunch of grapes stand out from the background in a clear reference to the bread and wine of the Eucharist. From the junction of Highways 7 and 67 drive north on Highway 7 approximately 6.4 km. Turn west (left). The church is about 100 metres down the road on the right. St. James located just north of Solsgirth and about 50 km southeast of Russell. A second equally beautiful church, named St. Stephens and located in Solsgirth itself, has recently been closed down and is showing signs of deterioration. St. Mary (Winram Memorial)/St. Alban, a fieldstone church located southwest of Kaleida. The Church of the Advent, 2 km east of Kola off Provincial Road 257 near the Saskatchewan border. St. John the Divine in what remains of the hamlet of Rounthwaite north of Wawanesa. This church is showing some signs of deterioration. 100 Years of History, Stonewall Rockwood Municapality History, 1982. Completed in June of 1889, Grund is the oldest surviving Icelandic Lutheran church in Canada and a designated Provincial historic site. It is located between the villages of Baldur and Glenboro, approximately 180 kilometers southwest of Winnipeg. The pioneers who built the church had originally settled in the short-lived “State of New Iceland” on the western shore of Lake Winnipeg. Battered by outbreaks of scurvy and smallpox, and facing shortages of food and shelter, some of them began looking elsewhere for a new and less hostile home. In August of 1880 one of their leaders, Sigurdur Kristofersson (later anglicized as Christopherson), traveled to the region north of Pilot Mound and registered the first homestead on a piece of land which he called Grund (Grassy Plain). Guided by John Taylor, an English missionary and brother-in-law of Christopherson, the first settlers left Gimli on 15 March 1881 and reached their destination on 31 March. Upon arrival they congregated in the vicinity of Christopherson’s farm. It was near this spot that the church was built eight years later. Initially religious services were held in private homes or recently built schools, but soon the pressure of a burgeoning population forced the settlers to organize on a more formal basis. Two distinct congregations were established: the “Frikirkja” on 1 January 1884, and the “Frelsis” on 25 July 1885. Work on the new church, intended to be used by both congregations, began in 1889 on a two-acre piece of land purchased from one of the settlers for $10.00. All the labour was performed by volunteers under the direction of carpenters Byring Hallgrimson and Arni Sveinson. In 1896 a steepled belfry was added to the structure to accommodate a newly acquired 230-kilogram bell. The organ, still in working order and originally standing on a platform against the east wall, was purchased in 1911. Several outbuildings, including a stable and a home for the minister, were built shortly after the completion of the church, but were torn down in the 1930s and 1940s. A small cemetery, serving as final resting place for some of the original pioneers, is located some three hundred metres to the east. For many years Grund served the members of both the Frelsis and Frikirkja congregations, but in 1910 another church was built at Bru, a few kilometers northeast of Grund, to service the needs of those living in the eastern part of the settlement. This church was best known for its stained glass windows and fine organ. Four years earlier a third congregation, the Emmanuel Lutheran, had been formed in Baldur and in 1907 its members built the Baldur Emmanuel Lutheran Church. With the construction of these two structures, and the serious rural depopulation that coincided with the depression and the dust bowl of the 1930s, the membership at Grund began to decline. In 1965 the Frelsis congregation merged with that of the Emmanuel Church. Nine years later Grund was declared a provincial historic site and maintenance of the property was turned over to the Manitoba government. Unfortunately, the survival of Grund came at the expense of Bru, which was eventually moved to Cypress River where it now serves as a restaurant. From the junction of Elizabeth Street (Highway 23) and Oak Creek Road in Baldur drive north on Oak Creek Road for approximately 9.2 km. Located on the right-hand side of the road, the church is hard to miss. Almost all of the route is over a gravel road. While driving through town you will pass the Emmanuel Lutheran Church on the left. The excursion will take you through an area of scenic hills and pothole lakes created during the most recent period of glaciation. Two other Lutheran churches in Manitoba are worth a visit. Bethany Lutheran, located approximately 3.2 km north of the junction of Highways 10 and 45 and approximately 1 km east. Hecla Lutheran in Hecla Village on the shore of Lake Winnipeg. Come into Our Heritage, Baldur, Rural Municipality of Argyle, 1981. On 9 April 1879 a group of families from Pictou County in Nova Scotia departed on a journey to new homes on the Canadian prairie. Led by their Presbyterian minister, George Roddick, they were responding to newspaper advertisements placed by a federal government concerned about American influence in its western territories. Traveling - ironically - via Chicago and Minneapolis, the band arrived in St. Boniface on 17 April and departed four days later for Prince Albert. Near De Winton (now Carberry) they were accidentally diverted south of the main trail. By the time they realized that they were lost they had reached the site of modern Chater, a few kilometers east of Brandon. The exceptional quality of the land, plus the relative proximity of a large market in Winnipeg, convinced the pioneers to remain where they were. They settled at the base of a series of sandy hills composed of terminal moraine deposited by receding glaciers, and variously called the Blue Hills, the Moosehead Hills and the Brandon Hills. Later that summer they were joined by substantial numbers of Presbyterian and Methodist immigrants from other parts of Canada and the United States. At first religious services were conducted in the homes of various parishioners, but in 1896 the Presbyterians joined their Methodist neighbors to build a Union Church for the use of both denominations. It was constructed on a plot of land donated by George Roddick and was modeled on the Neo-Gothic church in Durham, Nova Scotia where he had first performed his ministerial duties. Designed by architect W. H. Shillinglaw and constructed of wood frame on a stone foundation, the building measures approximately 12 metres by 9 metres. It is entered through a vestibule surmounted by an ornate crenellated tower featuring an arched portal and a plain roundel. Two arched windows flank the tower and more continue along the side of the church. The total cost of the structure was $2140. The opening service occurred on 18 October 1896, after which use of the church was shared by the two denominations with alternating morning and evening services. About 1900 a house in nearby Rounthwaite was bought to serve as a manse and a year later the bell from the original church in Nova Scotia was installed in the belfry. The organ dates from 1919, the communion table from 1939. The cairn on the left as one faces the church was unveiled on August 13, 1939 to mark the sixtieth anniversary of the arrival of the first pioneers. A scroll listing the people involved - headed appropriately by the names of the Reverend and Mrs. George Roddick - was placed inside the church itself. On the right as one faces the building is the cenotaph, unveiled on 19 June 1919 to honour those from the district who had served during the First World War. The cemetery contains the graves of many of the original settlers. In 1925, when the United Church came into existence, Brandon Hills Union became Brandon Hills United. During the hard times of the depression, drought, and war which followed, the church remained the centre of religious, social and cultural activity. It remains active today, albeit on a more limited scale. Sitting in the shadow of the Brandon Hills, it is a gem of Manitoba architecture. From the junction of Richmond Avenue and 18th Street in Brandon drive 6.4 km south on Highway 10 to Spring Valley/Ferguson Road. Turn east (left) and drive approximately 6.4 km along Spring Valley Road (gravel). Turn south (right) and drive approximately 1.6 km to the next intersection. The church is located on the southwest corner of the intersection. Bellafield Prebyterian, located on Bellafield Church Road about 300 meters west of Highway 18 between Highwary 23 and Killarney. Arizona Presbyterian, originally located southeast of Sidney, now at the Manitoba Agricultural Museum near Austin. Bethel United, northwest of Treherne. 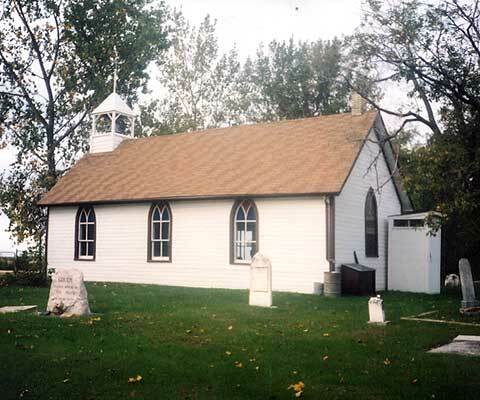 Little Britain United Church, located just south of Lower Fort Garry, north of Winnipeg. Kildonan Presbyterian, located at the junction of Main Street and John Black Avenue in Winnipeg. The Brandon Hills Story, Winnipeg, Murray McPherson, 1979. Update (20 December 2010): We are informed that the Brandon Hills Church was burned by vandals about five years ago but was rebuilt by parishioners and is still in use. The fragility of Manitoba’s heritage of historic architecture is perhaps nowhere better demonstrated than in the fate of many of its Ukrainian Catholic and Orthodox churches. Arriving in the province at a time when most of the fertile land was already occupied, the Ukrainian pioneers tended to settle in three areas of relatively unproductive soil: the country around Duck Mountain and Riding Mountain; the northern Interlake; and the far southeast around Caliento, Stuartburn, and Vita. These locations have all been subject to severe rural depopulation and the physical structure of many of the churches has suffered accordingly. Add to this the brutal climate and the often straitened condition of the pioneer’s finances, plus the sheer number of Ukrainian Orthodox and Catholic churches, and it is perhaps not surprising that some of the heritage has been lost. But there are many important exceptions to this general rule and the Ukrainian Catholic Church of St. John Dolyny is certainly one of them. Located approximately 11.5 kilometers northeast of Menzie, St. John Dolyny is a designated provincial historic site and a fine example of Ukrainian-Canadian architecture. It was designed on a relatively intimate scale by the Reverend Phillip Ruh who was later responsible for the Church of the Blessed Virgin in Mountain Road and for the Immaculate Conception Church of the Virgin Mary in Cook’s Creek. The building was erected between 1904 and 1907 by carpenters Ivan and Peter Kotulsky. Constructed of wood on a cruciform plan, the church is surmounted by a large silver-colored dome with four cupolas at the points of the cross. The large windows on the sides of the dome provide the interior with a direct source of sunlight and render the structure less massive than might otherwise be the case. Additional windows are located on the façade and sides of the church. The natural lighting is supplemented by that from the large chandelier hanging from the central dome. Dominating the interior is an elaborate iconostas built by Zakharko Poloz and decorated with paintings by the prominent artist Jacob Maydanyk. One of the most interesting features of the church, and a clear indication of the role played by the climate in any Manitoba building, is a wood burning stove which has occasionally been used to supplement the electric heating. Directly in front of the church stands a large cross and off to the right is a bell tower. The parish hall was built in 1939. A hundred metres behind the church is a well-maintained cemetery with the graves of some of the pioneers who first settled the countryside. Despite the fact that St. John Dolyny has been designated an important provincial historic site, there appears to be no consistent timetable for access to the interior. The location of the building is quite isolated (part of its charm), but this inevitably raises problems of potential vandalism or theft. When visited in September 2002 there was some deterioration and some places needing paint, but the basic structure of the building remains intact. The grounds around the church and cemetery are immaculately tended. From the junction of Highway 45 and Provincial Road 566 near Menzie, drive north on PR 566 (gravel) approximately 7.3 km to its junction with Provincial Road 470. Turn east (right) on PR 470 and drive approximately 3.3 km. Turn north (left) and drive approximately 0.9 km. The church is on the right-hand side of the road. St. Elias Ukrainian Orthodox, Sirko, south of Highway 12 in southeastern Manitoba. 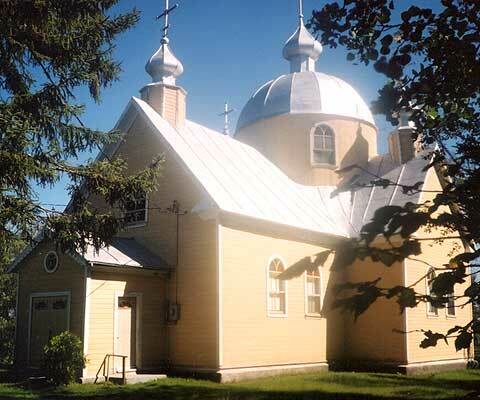 St. Michael’s Ukrainian Orthodox, Gardenton, a provincial historic site southwest of Vita. St. Elie Romanian/Ukrainian Orthodox, a provincial historic site at Lennard near Inglis. A pair of churches, Ascension of Our Lord Jesus Christ Ukrainian Catholic and Holy Ghost Ukrainian Orthodox at Petlura north of Riding Mountain. Rotoff, Basil, Monuments to Faith, Winnipeg, University of Manitoba Press, 1990. Kowcz-Baran, Anna Marie, Ukrainian Catholic Churches of the Winnipeg Archeparchy, Saskatoon, Archeparchy of Winnipeg, 1991.